A call this morning for a Commonwealth Dairy Advocate to ensure dairy farmers in Gilmore get their fair share. Nationals’ candidate for Gilmore Katrina Hodgkinson says a mandatory code is on the way and a stand-alone Federal advocate would make sure it works properly." To be able to act as a mediator between both farmers and protestors.At the moment we have a system where there is a NSW Dairy Advocate, but I believe we need to expand this out to the national level." 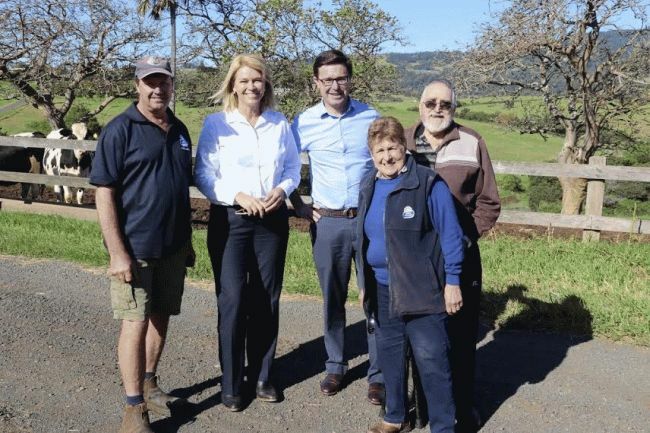 Photo: Ms Hodgkinson with Federal Agriculture Minister David Littleproud and Raison farmers Kiama.